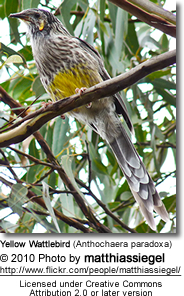 Wattlebirds (Anthochaera) are members of the Honeyeater family, and native to Australia. Wattlebirds are characterized by their wattles. These are bare fleshy appendages, usually wrinkled and often brightly colored, hanging from the cheeks, neck or throat, and presumably serving for display. The exception is the Little Wattlebird, which lacks wattles. 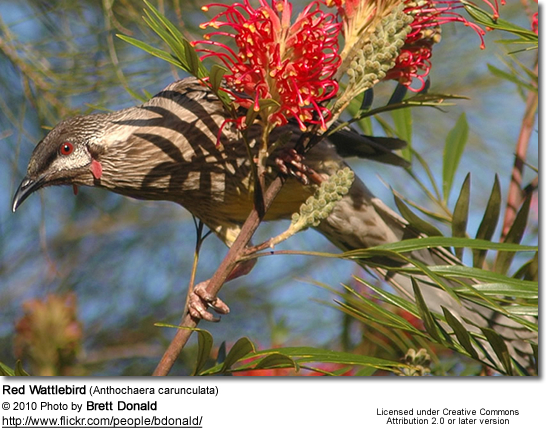 Some other birds also have wattles, although they are not known by the term "wattlebird". Examples include the turkey; some vultures; and several species of lapwing. The entire Callaeidae family of New Zealand, comprising the Tieke (also known as the Saddleback), the Kokako, and the extinct Huia, are also known as wattlebirds, but are unrelated to this genus.